The University has just published Measuring the Difference, a report into the economic and social impact of the institution upon Greater Manchester and the UK as a whole. The numbers make impressive reading. Our turnover, for example, is higher than both Manchester United and Manchester City’s combined. Almost 21,300 jobs in Greater Manchester are dependent on the University and our students. Across the UK as a whole, nearly £1.3 billion of the country’s gross domestic product can be traced back to the University. However, the true weight of the University’s commitment to social responsibility can only really be appreciated when you look at the real people behind the big numbers. Choel Cartwright is a local resident committed to her community. She is a proactive member of the steering group for a new project to position the University as an ‘anchor institution’, bringing benefits to neighbouring Ardwick. She has also been working with the University on a range of projects after years of redevelopment in the area. She says the reason Manchester’s social responsibility schemes work is “because you can tell they really care”. “Working with the University has really built bridges with the local community,” she says. “It supports us to help ourselves, rather than just doing things for us, which I think is very important: it gives us control over what happens on our doorstep. Choel believes new community-University partnerships such as helping to re-introduce green spaces in Ardwick have helped bring the two closer together. By positioning itself as an anchor institution, the University is making great strides as an organisation, improving connections with neighbouring communities and changing the lives of local people for the better. But what about the people who make up the organisation? Staff at the University recently took part in the 10,000 Actions programme, the biggest environmental sustainability initiative in the higher education sector. To date, staff have committed to more than 27,000 actions in order to improve our environmental sustainability, both individually and collectively. But he’s not satisfied with just making changes himself – Joe now supports other colleagues to take positive action. “I’ve unofficially become the sustainability lead in the building, so people ask me questions about how they can have a greater impact,” he says. 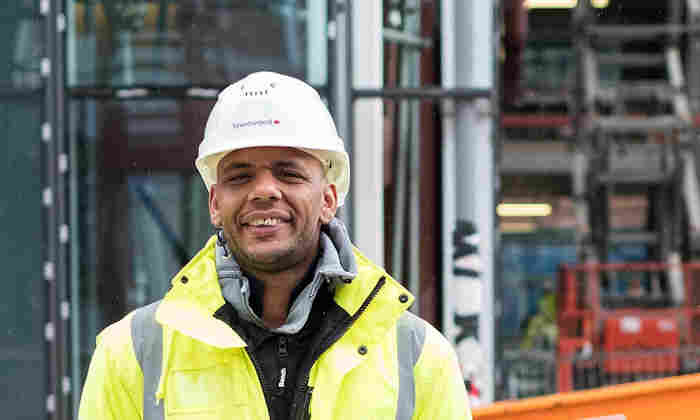 The initiative with perhaps the most tangible impact on the lives of individuals is The Works, an innovative employment and training initiative working at the heart of local communities in Moss Side and Ardwick. The Works has so far helped more than 3,000 local residents access job opportunities with the University and other partner employers. But it’s much more than a matter of pride for Alvin. Having this job has transformed his life and opened doors to a brighter future. “Before, I couldn’t see a way forward, but now I can,” he says. It’s clear that by making a difference to individual’s lives, The University of Manchester can make a wider impact on society. So let’s try a new kind of statistic. Multiply the transformation of one life by the sheer scale and breadth of the initiatives the University is committed to, and the impact starts to become clear: it’s huge.